Notes from my recent Android O update. I have been having serious battery drain issues on Android 7.1.2 with my Nexus 5x. They are related to my carrier, Cricket, it seems. If I turn off 4G/LTE, my battery life would return to normal. This was written after my Nexus got into a bootloop after I tried to reset to factory defaults after Android O Beta had already been installed. I also discovered my upgrade process that a bootloop can happen if the original upgrading platform is an unlocked and rooted 7.1.2 installation. 1. Enable Developer options on phone. 3. Connect phone to USB and check box to authorize the computer. 4. Open command prompt with Admin privileges. 6. Wait for device to reboot into bootloader. 8. Select Yes on device to proceed. 9. Device should reboot back to the bootloader screen. 10. Now run “flashall.bat” from the zip file you downloaded previously to install the latest stock 7.1.2. 11. Let device complete setup and get to the initial setup screen. 12. Power off the device. 13. Power the device back on to bootloader mode (Power + Volume Down). 15. Allow device to wipe and then reboot. 16. Walk through normal setup. 17. Once your Google account is set up and setup completed, you should see the System Update notification for the beta download. Once done, do not do a factory reset, it will result in a boot loop. Last night we had a power outage (unplanned) at home that lasted longer than my UPS could, and I was asleep. 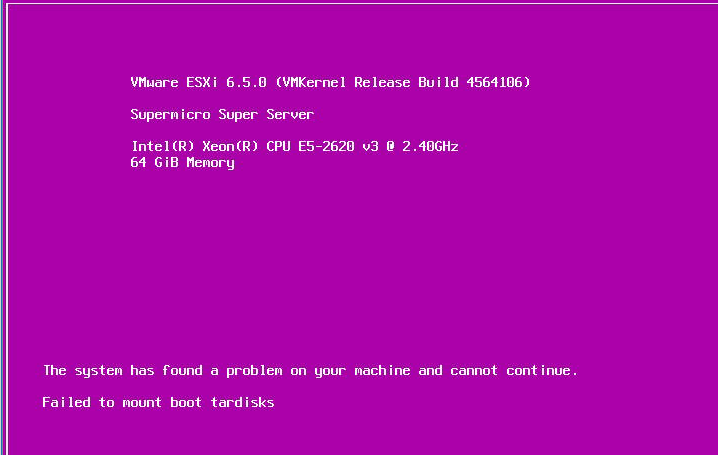 When I woke up and powered on my VMWare Lab server I was welcomed by this purple screen shown below. I could not find anything on Google or the VMWare KB database about this error. I was able to ‘recover’ by downloading the upgrade ISO from VMWare for 6.5.0a and proceeded to upgrade my 6.5.0 environment on this one host that I have. The upgrade was successful and my host came back up without any issues.